The average UK household loses an estimated £470 a year because of avoidable food waste, and 34% of this household waste is due to the food going past it’s ‘use by’ or ‘best before’ date, when in reality the discarded food is still edible. If food waste was a country, it would be the third largest producer of greenhouse gases in the world, after China and the US. In the UK, 60% of all wasted food is perfectly edible. The reason for this is cautious expiry dates which are kept short by the food industry to be on the safe side. With this in mind, the Mimica Touch is being developed. 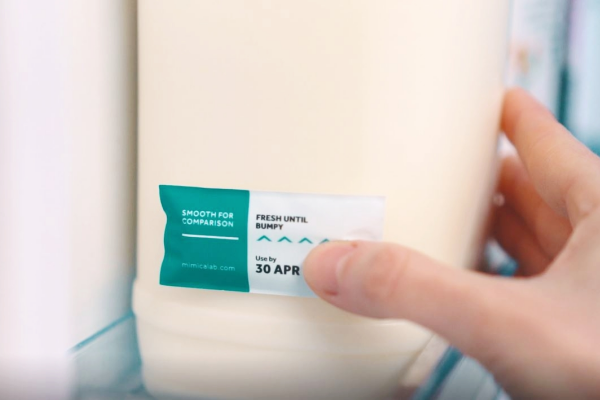 Spotted at 100% Design this year, this freshness indicator degrades at the same rate as the food it carries, meaning generic expiry date labels can be replaced with packet-specific labels, thereby helping to prevent the premature rejection of food and drink. Mimica Touch is a patented tactile label that tells you exactly when food spoils, accurate to a few hours. The label is activated as soon as it is attached to the packaging and contains a gel that is calibrated to spoil at the exact same rate as the target food. The gel is made from waste materials from the food industry, meaning that it is actually experiencing decay, adjusting to conditions along the way and is accurate to one hour.